The Bullvine decided to take a closer look at the top (2012 August) 100 GLPI Canadian Holstein young bulls. To make it more informative the analysis is by groups of 25. It is important to recognize that the average reliability values for these genomically tested young bulls are between 64% and 69% almost as high as some new release bulls in the past. Behind us are the days when young bulls indexes were 33% to 37% reliable and posed a much greater risk due to low reliability. The top 100 GLPI young bulls are truly an elite group with production index values compared to recently proven sires of 98%RK for milk, 99%RK for fat and 99% RK for protein yields. An interesting note is how the top twenty-five stand out ten percent above the others, while each group afterwards drops by about 5-6%. A much greater variation than all other traits. On average the type indexes of these top 100 GLPI young bulls are very high. The equivalent to a 98%RK for CONF for the recently proven sires. Note that the 26 to 50 group have the lowest type trait indexes to go along with high fat and protein especially for % Fat and % protein. In many cases, the bulls in the 26 to 50 group are the full or half brothers to the 1 to 25 group, who may have gotten more components but are not as high for CONF and Mammary. The average Herd Life and SCS ratings for these bulls are very good, positively contributing to H&F augmenting the GLPI values. However it must be noted that the Daughter Fertility ratings are only average detracting from the overall GLPI values for these bulls. Daughter Fertility is a trait that is primarily affected by non-genetic factors, but has a significant impact on the bottom line of any operation. The breed needs to be concerned because daughter fertility is not likely to see any significant gain genetically by using these bulls. As we all know more pregnancies equals more profits. Definitely more attention and more research needs to be given to the genetic evaluations and genetic merit of the breed for Daughter Fertility. These top 100 GLPI young bulls are truly outstanding! They are exceeding by 982 LPI points the value required for a recently proven sire to get a 99%RK for GLPI. This was not even dreamed possible before there were genomic analysis using SNIP technology. Note that the Parent Average LPI’s are lower than GLPI’s and DGV LPI’s and are very close to being the same for all four groupings. It is in fact the young bulls DGV’s that put them in the top 100. They have full and half siblings that have lower DGV’s. This supports our previous analysis of 7 Reasons Why You Shouldn’t Use Genomic Sires With DGV’s Lower Than Their Parent Average. The AI sire analysts have made very good use to the DGV’s after initially identifying bulls from their pedigrees, and then sampling those who’s DGV’s exceed their Parent Average LPI’s by a goodly amount. Think about it, the average of the top 100 young bulls at +2982 GLPI, and there is only one Canadian proven sire above that level. It should be noted that the dams/ DGV LPI’s for the first grouping far exceed the other three groupings. Even if you factor in for a slight decrease in values, the top 25 would still all rank higher than the highest current proven sire. Inbreeding is a concern that must be addressed as the top 100 GLPI young bulls are from a limited number of parents (Read more – Inbreeding: Does Genomics Affect The Balancing Act?). With Oman Oman, Snowman and Freddie all Oman sons inbreeding must be watched. 82% of the young bulls are sired by daughter proven bulls and 22% are sired by genomic young sires. Definitely there is more pedigree variability amongst the dams than the sires of these young bulls. All dams are milking cows. Five dams are below +2000 GLPI, 33 dams are below +2000 DGV LPI and 6 dams do not have DGV LPIs as they reside outside North America. The Bullvine is not able to do as extensive an analysis on the NAAB list as the DGV TPIs are not available for analysis. Below are the average ratings for the top 100 young bulls. Note this group is similar to the Canadian one hundred young bulls – again a significant concern is that fertility is not high. The use of genomic testing has provided a very significant opportunity to increase the rate of genetic improvement in herds that use North American sampled Holstein bulls (read more – The Genomic Advancement Race – The Battle For Genetic Supremacy). The top 100 GLPI young Canadian bulls are the equivalent to over 99%RK for recently proven sires. Congratulations to the breeders and breeding companies for using the genomic results to produce the young bulls. Thank you to the breeders who use the top young bulls. A bright future is ahead. Since the Bullvine started in February (and even before), I have had many dedicated breeders ask me ‘Why do the Artificial Insemination companies keep going back to the same herds for young bulls when few if any bulls from those herds ever make it to active proven status?”’ That prompted me to ask – is that true? For many breeders it can be hard to determine which herds they should use young sires from and which ones they shouldn’t. For many AI companies, and sire analysts they have had their thoughts about which herds are hot and which ones are not, but never had the numbers to prove it. This has us asking has genomics truly eliminated the hothouse effect in sire sampling (read more – Has Genomics Knocked Out Hot House Herds). 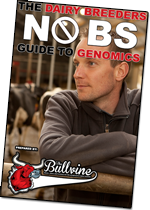 In true Bullvine style we decided to tackle this tough question to help breeders have confidence in which genomic tested young sires to use. We first took a look at all the herds that had more than one sire receive their first official proof in the August 2012 proof run. In studying proven bulls we found that most of them fall within the range for difference between the individual bull’s parent averages and official proof of 150-200 LPI points. And for most of the herds hear falling within that same range. *Please note to calculate Estimated Daughter Performance we took each sire’s official proof and back solved considering his DGV and PA using the published CDN formulas and weightings. For both breeders and A.I. companies it can be very challenging trying to figure out which genomic tested sires to use and which breeding programs they should consider investing in. As we have found out the numbers tell the whole truth. Genomic results do give us very reliable information. While it may be true that for some of herds it can be said that they breed better female than male bloodlines. Nevertheless, that does not fully explain why A.I. companies have continued to sample bulls from some herds. It also does not justify why sire sampling herds should be asked to take on the risk in their herd improvement programs. As one of my breeder friends often tells me – use the best, cull or ignore the rest. It used to be that every artificial insemination center could claim an advantage in a certain product offering. Semex would claim a type advantage that over the years converted to a longevity value, in order to appeal to the much larger commercial market, instead of just elite breeders looking for the next great show cattle. ABS global added product lines and partnerships such as Judges Choice to counter moves such as Semex’s and included strong type offering to their very commercial product line. Every AI center jockeyed back and forth to show how their genetic product offering was different. Even when they overlapped, they would claim greater reliability or stability based on the country or system of origin. Then along came genomics and wiped all that out. Today when you look at all the major A.I. centers products, you could take the name and stud code off and you would be hard pressed to notice any difference. They all try to offer a complete product line. Moreover, with the reliability, and ability to take the system or country of origin out of it, they all have pretty reliable product. This almost completely eliminates any genetic advantage that any A.I. center has. It has been very interesting to watch companies like Select Sires take to owning top bloodlines in a big way (to read more check out Should A.I. Companies Own Females?). This may be the only way that A.I. companies can differentiate their genetic advantage. Buy owning the top females these genetics companies (at this point, they are no longer just an A.I. company), are able to develop distinct bloodlines that none of their competitors can have. This is only going to change more when breeders have full access to genomic information in 2013 and may start to sample and prove their own sires. Think about it. I remember back when I was working with GenerVations, and Champion hit as #1 in Canada. We marketed the heck out of the fact that he was the best in Canada. We relied on the world’s confidence in the Canadian system to promote that this new, small A.I. center had a reliable product. We blasted that message around the world making sure everyone knew that GenerVations had the #1 in the world. Because we all knew that there was about a 2-3 year window before competitors would have their own Champion sons, or he would no longer be the top bull. Today we are looking at an even smaller window of opportunity. . With new genomics bulls coming out pretty much monthly, things can change in a heartbeat. The Select Sires program at least gives them 8 months advantage on the sires and total control over the dams (since they own them). This gives them the ability to offer their customers a distinct advantage by doing business with them. Some may look at it negatively and yet, from a purely business perspective, it makes total sense. In the end, it will look like a very shrewd investment in a market in which it so is hard to differentiate yourself. Therefore, when you can no longer differentiate your company on product, it only leaves you two other options, service, and price. You are either going to become the Wal-Mart of the A.I. world or you are going to become Nordstroms’s. Both can exist in the same market place you just have to become extremely great at what makes you different. If you want to become the Wal-Mart of the A.I. world, you are going to offer the lowest price for a very commercial product. This means you need to have your production facilities running super efficiently and your overhead at a bare minimum. This position plays extremely well to commercial producers who are looking for the lowest costs possible. For years, companies like ABS, Alta Genetics, and Select have battled very aggressively. Since most of these companies more or less were just selling a commodity, there really was not any brand loyalty. Since most large herds did their own insemination work, they eliminated the close link that is developed between producer and the A.I. center through the regular visits by the technicians doing the insemination work. While the major A.I. companies tried to lock in that connection again by offering mating programs and other services, since they all were pretty much the same and, often, not used by producers, they were only able to gain marginal difference. And like the Wal-Mart model, margins are tight and profits are slim. Therefore, if you cannot compete on product and you cannot compete on price, that only leaves service. With the majority of the marketplace doing their own insemination, A.I. companies have to look outside the scope of traditional marketplace to provide services. While this has been the case for many years in the commercial marketplace, it is also fast becoming the case in the entire marketplace. While you may be able to get a slight premium when you have the #1 bull, otherwise you will live and die by the quality of service you offer your customers. We have already seen this happen. Many A.I. companies have gone to offering many non-genetic products in order to become a complete service organization, rather than just a supplier of genetics. Also of interest, is how the roles of sales and sire analysts have also changed. While many have called the modern sire analyst a glorified tail hair puller, they are now becoming more of a breeding advisor mixed with a negotiation specialist. This is exactly what they have to do. They can provide insight to breeders about the daughters of the top mating sires and maybe a little insight that his proof will not tell you. Even more so, they are now the chief negotiator for their A.I. center. If I were a GM of an A.I. company, I would invest heavily in negotiation and relationship building training for these individuals. Realistically, unless you run a program like Select Sires, this will be your only way to get the top sires from many breeders. Like most mature market places, there is little room for grey areas when it comes to the future of the A.I. industry and where the major A.I. companies position themselves. It will take strong action now either to develop very aggressive genetic programs like Select Sires has, or you will need to decide if you are going to be the lowest cost provider or offer the greatest service. And yes, I know there are many small micro A.I. companies that will be able to turn a profit. I get that, they are able to keep their overhead so low that they will be able to offer a niche product to small segments of the market place. However, when it comes to the big players, they need to ask themselves, “Am I going to get aggressive and develop distinct bloodlines?” “Are we going to be the lowest price provider?” Alternatively, “Are we going to become legendary for the quality of our service?” Anything that is a smorgasbord of these will only end in extinction in the end. Don’t think so? Look what happened to your local hardware store, when Home Depot moved in, or the independent grocer, when Wal-Mart put up one of their super centers in the same community. Where do you shop today? Who will be your provider tomorrow? What do you think? Comment below our join the discussion on our facebook page. The debate is back! While Artificial Insemination companies have owned females for many years, with recent dominance by some AI breeding programs on the TOP GTPI list in the US and the upcoming ability for breeders to sample their own bulls, the debate is at the forefront again! Over the years there have actually been many examples, with mixed results when A.I. companies have owned their own female bloodlines. Back in 2001 Alta Genetics caused considerable stir when they planned to take their embryo program and convert it into a 1000 elite females test herd to have sires sampled through 100 contracted progeny test herds. While the program had many supporters from the genetic advancement side, it was seen as very risky and ultimately was put on hold when Alta purchased Network Genetics. The herd was then dispersed to farms owned by Alta in Canada and Holland and in four independent herds in the U.S.
GenerVations is probably a great example of an A.I. program that has had a lot of success owning their own female bloodlines. Starting with Albert Cormier’s part ownership of Skys-The-Limit Claire where he was able to maximize profits from both sides, thanks to Champion. Continued by GenerVations part ownership of Lylehaven Lila Z, owning female bloodlines has been what enables GenerVations to compete on a global scale. Not being able to have a large sampling program, GenerVations has had to focus on potency rather than volume. Selecting on the very top bloodlines and putting all your eggs in a few baskets means GenerVations has to take a larger risk than the big A.I. companies. Owning top females has helped them manage the risk. The Genex CRI Genesis program has been around since 1989. While heavily focused on top Index cattle they have been able to achieve success on the female side with such cattle as MS Pride Plnt Tasket 788-ET who tops TPI and Lifetime Net Merit lists. On the male side, the Genex program has proven to be very stable in their bull program. The 54 Co-op prefix bulls averaged a mere $1 drop in Lifetime Net Merit (LNM) as they transitioned from genomic-only genetic evaluations in August 2010 to daughter-proven genetic evaluations in December 2011 (minimum of 40 daughters). The average change among the 1,879 bulls industry wide over the same time period was a $22 decrease. While the St. Jacobs ABC’s Judges Choice program has been around for many years marketed in partnership with ABS Global. They have more recently entered into the ownership of top female bloodlines with the purchase of Ashlyn, Hezbollah, and Barbara. Choosing to focus on established show cattle has meant that the Judges Choice program has been focused on young sire sales with sires achieve proven status being an added bonus. Probably the A.I. Company making the biggest waves today is Select Sires. Select has been very aggressive in the ownership of top genomic females to the point that on the December Top 200 Genomic Female list they owned 18% of the top 50 new genomics heifers in the US. With Ladys-Manor PL Shamrock and others, Select Sires is investing heavily in ownership of top genomics females in order to produce the next generation of top TPI Sires. The biggest reason this issue is coming up again is because genomics is changing the prominence of industry sires with no daughter proof data, and virgin heifers are now in heavy demand as for contract matings. Genomics has deceased the risk to such a level that it can be very economically viable for these A.I. companies to invest in top bloodlines and increase their genetic advancement rate faster than their competition. By being able to control the matings on these top females and use top (often unproven ) genomic sires on these virgin heifers they will be able to greatly increase their rate of advancement over their competition, and in fact fast than even top breeders. That is because they will have access to their own top genomics young sires sooner. They can use them on contract matings far faster than any breeder can. This gives them a distinct competitive advantage over both other A.I. companies and over breeders. A.I. companies owning females seems to be a very touchy issue for many breeders. While many of these companies are perfectly within their rights legally, it comes down to a question of public perception. Many companies, such as Semex, have taken a very vocal position that they do not own females. Given that Semex is a member owned co-operative, it’s understandable that they do not want to be in competition with their breeders, many of whom are the top suppliers of sires to many A.I. companies worldwide. However, Select Sires is also a federation of nine farmer-owned-and-controlled cooperatives. You could not have two more extremely opposite positions from two very similarly owned companies. Genomics has changed the breeding world. However, it has also created a wild wild west environment where both breeders and A.I. companies are figuring out what the new world will look like. Will A.I. companies be nothing more than service companies that deliver genetics from many sources (much like a Wal-Mart) where they are more based on quality of service and customer experience than the genetics they have to offer? Will more and more top breeders try to increase their own profits and sample their own sires? (Watch www.thebullvine.com for articles on these issues coming shortly) The important thing to note is that some A.I. companies have taken early steps to control the source and supply top genetic animals to their customers. The world is changing and so will the inter-relationship between breeders and A.I. companies, in many cases they are no longer just a customer they are now a competitor. What do you think? Leave your comments in the box below.